Lady Melbourne-Pheobe's fashion blog has been a favourite of mine for ages. I was reading her blog in school so it's been that long. Anyway, Pheobe does the classic, ladylike style best. She incorporates on-trend pieces into her style, but they're ones that transcend seasons. Pheobe always finds the coolest things as well. Avenue Maria-Another of my favourite blogs-this time from Australia. Maria shares outfit snaps from her posts, pictures of her illustrations and cute snaps from her day to day life. Maria also has the best eye for gems when it comes to thrifting so expect to see gorgeous vintage-inspired pieces and gems she finds on her Instagram as well. Jane Keltner De Valle-In The Devil Wears Prada Nigel claims a million girls would kill for the chance to be Miranda Priestley's assistant. I'm sure a million girls would also kill to be doing Jane Keltner De Valle's job as Senior Fashion News Director at Teen Vogue. Expect to see plenty an insight into the world of fashion magazines and the odd Macaron. Daily Sass-I stumbled upon Caelan's blog when I was watching her video review of the Alexa Chung for Eyeko set. She best sums up her account as it's a treasure trove of 'fashion, feminism, fotography and other f-words'. Caelan has such rad style too! Her pictures make me want to dress better all the time. Man Repeller-If you're not following Leandra on Instagram then where have you been!? Her Instagram is an extension of her popular fashion blog. It is pure, unadulterated fashion goodness. That's all there is to it really. Views of Now-Whenever I see Izzy's outfit posts I feel as though I'm looking at a fashion editorial from a magazine, in the best way. Seriously, Izzy does the best styling and always has stunning backdrops. She also 'grams pictures of some pretty delicious looking organic food too. Karen Walker-My favourite New Zealand designer label. Clothes, jewellery, eyewear, homewares-I'm obsessed with all of it. Expect to see lots of stunning, covetable things. The occasional photo of sweet treats made with the Karen Walker cookie cutters always makes me hungry+want to whip out my cat cutter. 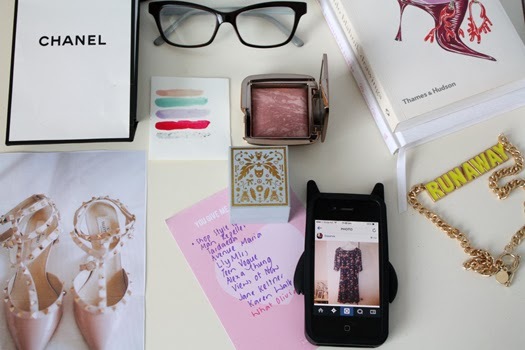 You get the idea-cute, pretty pictures and fashion inspiration all in one handy account. *Do you follow any Fashion Instagrammers? Who are your favourites?